Just in terms of theoretical throughput, M1 Downlink Max throughput is same as DL Category 0 which is 1 Mbps, but considering the repetivity scheduling, MPDCCH and PDSCH in separate subframes, Half Duplex operation, it will not be easy to achieve this throughput. The practical throughput may vary widely depending on DL / UL scheduling. 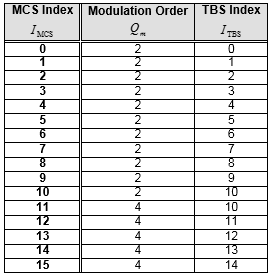 The modulation order is determined according to following table. CEModeB UE is not expected to receive a DCI format 6-0B indicating I_MCS >= 10. SIB Transmission : When SIB is transmitted, User Data does not transmitted. schedulingInfoSIB1-BR-r13 in MIB : This determines the repetition number of SIB1. As a result, it will influence user data throughput. mpdcch-NumRepetition-r13 in RRC Connection Setup : This may or may not influence user traffic. In 2 + 4 RB allocation, it would not influence the throughput, but in 6 RB allocation this would influence user data throughput since PDSCH / PUSCH cannot transmitted when MPDCCH is transmitted. fdd-DownlinkOrTddSubframeBitmapBR-r13, fdd-UplinkSubframeBitmapBR-r13 in SIB1-BR : These can activate or deactivate a certain subframe for transmission. Following is one example of scheduling pattern for user data. If we assume that eNB assing max TBS (i.e, 1000) the throughput will be around 300 Kbps DL and 300 Kbps UL.